Principaute de Catalogne ou sont compris les Comtes de Roussillon, et de Cerdagne, divisees en leurs Vigueries. 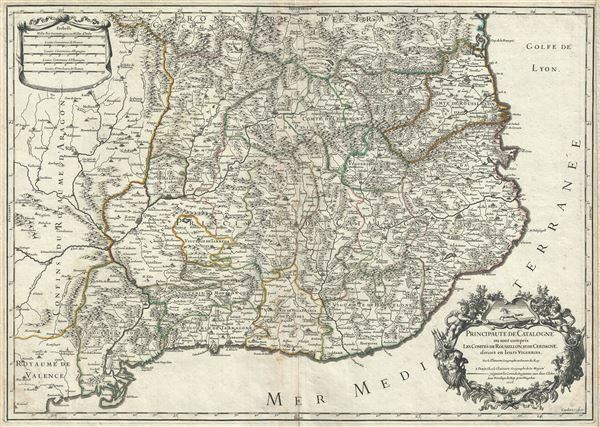 This is a scarce 1706 map of Catalonia, Spain by Alexis-Hubert Jaillot. It covers the northeastern Iberian Peninsula from Sigean in France to Peniscola on the Mediterranean coast. The principality of Catalonia at the time included the modern day autonomous community of Spain and the adjoining Catalan region of France (Northern Catalonia or Roussillon). The map renders the entire region in extraordinary detail offering both topographical and political information with forest and mountains beautifully rendered in profile. Spain at this was witnessing the War of the Spanish Succession. After the death of the Spanish Habsburg King Charles II, the Spanish crown passed onto his successor Prince Philip of Anjou. Fearing that a union between France and Spain would threaten the balance of power in Europe, the Grand Alliance of the Holy Roman Empire, Portugal, Dutch Republic and the Duchy of Savoy declared war claiming the Spanish throne for Archduke Charles of Austria instead of Philip. Catalonia, unlike the rest of Spain supported Archduke Charles of Austria. Barcelona would finally surrender after the Siege of Barcelona which ended on September 11, 1714 and the war would eventually end with Philip becoming King of Spain, on the condition that he is removed from the French line of succession. September 11, the day of the defeat, is now celebrated as the National Day of Catalonia. The lower right quadrant of the map features an elaborate title cartouche. This map was created by Alexis-Hubert Jaillot and Guillaume Sanson in 1706.